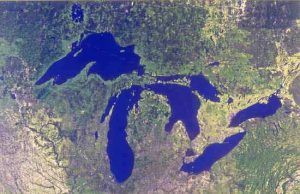 More like inland seas than lakes, the Great Lakes of North America are among the most treacherous bodies of water in the world. Terrible seasonal storms batter ships that choose to sail the lakes at the wrong time of year. These great gales, called the Witch of November, have claimed many lives and ships over the years, the most famous of which was the Edmund Fitzgerald in 1975. Strange things happen on the lakes that are unique to them, and sailors have long told stories of ghost ships on the great lakes in the same maritime tradition of the salt water ocean. The oldest of these ghost ships is the Griffon, launched in 1678 by the early French explorer and trader La Salle. The ship vanished on the return leg of its maiden voyage loaded with furs for trade. No trace of the ship was ever found until recently, when a possible candidate for the wreck was found by divers in the form of a very old hand-carved mast sticking out of the muck. In any case, sailors have seen a ghostly apparition of the Griffon under full sail on several occasions crossing lake Michigan. At least 10 more modern ghost ships are occasionally sighted plying the lakes, and even the giant 729 foot Edmund Fitzgerald was sighted a decade after its infamous sinking. But the stories do not end with ships. A diver working the Lake Superior wreck Emperor in the late 1980’s is said to have seen the ghost of a a crewman lying on a bunk looking at him. Easily the strangest and most macabre story is the tale of Grandpa. The great lakes are very cold in the depths, so cold that the frigid water will preserve almost anything through natural refrigeration. This includes human remains, and the story goes that there is a preserved body in the engine room of the wreck of the SS Kamloops, which went down in 1927. Locals and divers call him Grandpa, and he is known to float quietly behind divers, following them as they swim around the compartment. Perhaps this is just due to currents created by the divers, or maybe its something else, but the effect has scared the daylights out of more than a few divers. All the better, as they probably shouldn’t be disturbing a wreck that clearly is also the final resting place of preserved human remains. The great lakes may be the most fruitful ground in the world for paranormal stories of ghost ships and their crew. Sightings are almost common, and show no signs of slowing. What’s most interesting is that, unlike the oceans, the majority of the ghost ships seen on the lakes are modern, with many having been lost within living memory. What makes these inland seas so haunted? Maybe its the cold of the water, or the inordinate amount of tragedies that the lakes have seen. We’ll never know, but if you ever visit one of the lakes, watch carefully as the strange ship you see in the distance may just be a ghost ship. Would You Live in a House Where an Exorcism Was Performed?